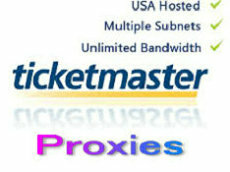 I am using http://www.myprivateproxy.net for Ticketmaster proxies. You should have mentioned myprivateproxy.net in this article as they also are offering cheap and high quality proxies with full service. yes,MPP always is the top proxy service on my list, The IPs for Ticketmaster are more strictly than others, so not so many proxy provider offer that proxies.